More often than our other species in shaded places, even forests, and rich soil, but usually in dry open sites, including rock outcrops, banks, grassy roadsides and hillsides; savanna of oak, hickory, sassafras, and/or jack pine, especially along borders and in clearings; but sometimes with beech and maple in moister forests. This is one of our commonest species, as well as the most easily recognized one; subsp. 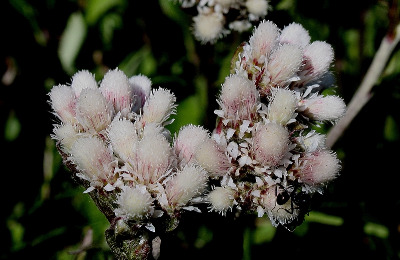 fallax (Greene) Bayer & Stebbins ranges throughout the state and has the basal leaves ± persistently pubescent above, often with bits of cobwebby tomentum adhering into late summer; subsp. parlinii has the basal leaves glabrous or nearly so above even when relatively young and also often has some tiny pink-purple hairs among the tomentum of the upper parts of the stem. 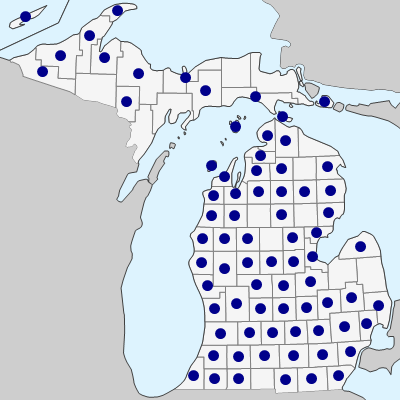 Subspecies parlinii occurs only in the southern third of the Lower Peninsula, north to Kent Co. Occasionally (especially on the Keweenaw Peninsula) plants of A. howellii subsp. neodioica are found that approach A. parlinii in a tendency toward 3-nerved basal leaves. MICHIGAN FLORA ONLINE. A. A. Reznicek, E. G. Voss, & B. S. Walters. February 2011. University of Michigan. Web. April 21, 2019. https://michiganflora.net/species.aspx?id=219.